Supercharge your day with a refreshing antioxidant-rich and protein-booster Beet and Dragon Fruit (Pitaya) Vegan/Paleo Smoothie Bowl! Each bowl is filled with fiber, vitamins, minerals, healthy fats, complete proteins, and no added sugar: a great way to give your body some love! Smoothie Bowls (smoothie-hybrids) are beautiful culinary works of art at, packed with delicious toppings and eaten with a spoon. It’s no wonder these delightful bowls of chilled nutritious ingredients are trending all over social media. Like having a giant bowl of healthy NICE-cream, smoothie bowls make a perfect quick-and-easy breakfast meal, snack, or dessert. Beets in a Smoothie Bowl? Yes! It may seem strange to pair beets with dragon fruit, especially if you aren’t a fan of veggies for breakfast, but the two ingredients make a fabulous combination. The sweet earthy beet taste blends well with slightly sweet and subtle dragon fruit. Plus - the combo of health benefits is fantastic! Both beets and dragon fruit are high in betalain, an antioxidant that helps protect our cells from harmful free radicals. Beets offer incredible health benefits, such as balancing blood pressure, detoxifying the liver and colon, boosting the immune system, and supporting brain health. There are so many reasons to eat more beets! 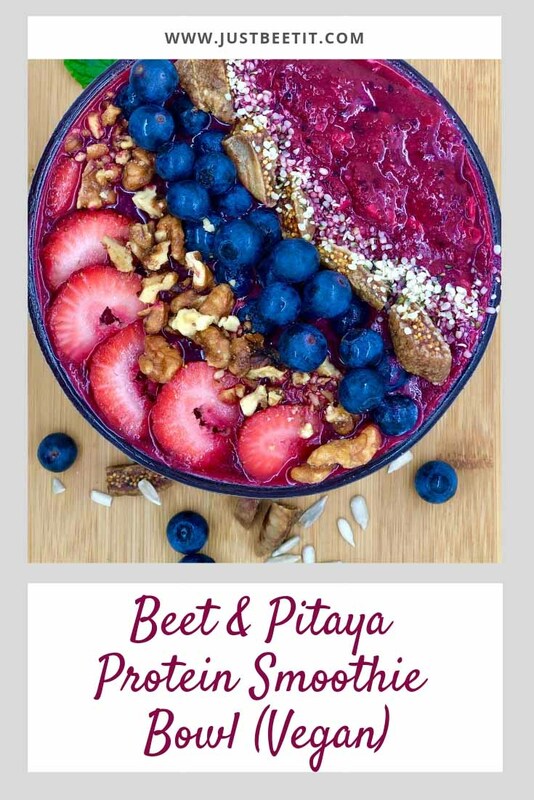 Adding the extraordinary crimson root vegetable to your smoothie bowls for breakfast is a great way to include the beet’s incredible health benefits in your diet. Not a fan of beet prep? Peel, chop, and freeze raw beets ahead of time in a sealed container to have ready-to-eat beets for smoothies and smoothie bowls. Dragon fruit (pitaya), belonging to the cactus family, is a tropical fruit rich with antioxidants, Vitamin C, and fiber. Known for its white and black or fuchsia and black interior, dragon fruit is a scrumptious addition to smoothie bowls and fruit salads. Beets and dragon fruit shine in this combination of smoothie bowl goodness, but we also added a little mango, banana and baby spinach for extra flavor and nutrients. For a smooth texture, use frozen banana and coconut milk (healthy fats) or add your preferred non-dairy milk. Need more proteins for breakfast? Protein helps you stay “full” and balance blood sugar levels. Adding 1-2 scoops (a serving) of dairy-free protein powder (Plantfusion) offers over 20g of protein. Top your smoothie with nuts and seeds for extra plant-protein. The options are limitless! Use Frozen Fruit & Vegetables: Frozen ingredients create a chilled and thick consistency for smoothie bowls. If you prefer buying fresh fruit and vegetables rather than frozen ingredients, wash fresh fruit and place in freezer ahead of time. Add liquid sparingly: The liquid to frozen ingredients ratio is key when making a smoothie bowl. Start with less coconut or almond milk and add a little more liquid at a time while blending. Too much liquid will turn your smoothie bowl into a drinkable thin smoothie. It will still be edible, but the texture will be different. Be patient when blending: To master the perfect smoothie bowl consistency, be patient. Pulse or blend frozen fruits and vegetables, pushing down chunks of fruit or ingredients and/or scraping down the sides of the blender until the ingredients are blended and the consistency is thick like an ice cream or frozen yogurt. *Look for Dragon Fruit (Pitaya) in fresh produce, but many grocery stores carry frozen dragon fruit packets in the frozen fruit and vegetable section. In a high-speed blender, add frozen beets, dragon fruit, mango, banana, and protein powder. Add dairy-free milk (start with a small amount and add as you go). Blend until smooth and creamy, like frozen yogurt or ice-cream consistency. Sometimes it helps to let frozen fruit sit in the blender at room temperature for a few minutes to gently thaw. If needed, push down chunks of fruit or ingredients and/or scrape down the sides of the blender. Be patient when blending your smoothie bowl ingredients. A good smoothie bowl has a thick texture, so keep blending the frozen ingredients and add liquid (coconut milk or almond milk) sparingly. Dive between bowls and top with fruit, nuts, seeds, or gluten-free granola. Smoothie bowls are best eaten fresh, but you can store leftovers in the refrigerator for up to 24 hours. Another option is to freeze leftover ingredients in ice cube molds for easy go-to smoothie mixtures. Enjoy!